Para o creme, ferver o leite. Misturar as gemas com o açúcar e amido de milho. Verter o leite e levar ao lume mexendo sempre até engrossar. Cobrir com película rente à superfície e refrigerar. Na batedeira, bater a manteiga com o praliné. Envolver o creme de pasteleiro aos poucos. For the cream, boil the milk. Mix the egg yolks with the sugar and cornstarch. Pour the milk and bring to heat stirring constantly until thickens. Cover with cling film and refrigerate. Using an electric mixer, beat the butter and praline. Add the pastry cream gradually. Levar o leite, água, sal, açúcar e manteiga ao lume até ferver. Retirar do lume e adicionar a farinha. Mexer bem. Levar de novo ao lume por cerca de 2 minutos até a massa formar uma bola que se despega do tacho. Colocar a massa na batedeira e adicionar os ovos um a um. Colocar a massa num saco de pasteleiro e, num tabuleiro forrado a papel vegetal, formar bolas muito próximas, tocando uma na outra apenas por um ponto, formando um círculo. Bring the milk, water, salt, sugar and butter to boil. Remove from heat and add the flour. Stir well. Bring back to heat for about 2 minutes until the dough forms a ball that detaches from the pan. Place the dough in the mixer and add the eggs one by one. Place the dough in a pastry bag and in a tray lined with parchment paper, form balls close together, touching each other by only one point, forming a circle. Amassar todos os ingredientes. Estender a massa bem fina entre 2 folhas de papel vegetal. Com um cortador circular, ligeiramente mais pequeno do que as bolas que formou previamente com o choux, cortar a massa. Colocar cada um dos círculos sobre uma bola de choux. Levar a forno pré-aquecido a 180º durante cerca de 25 minutos. Depois de arrefecido, rechear com o creme. Knead all ingredients. Roll out the dough very thin between 2 sheets of parchment paper. With a circular cutter, slightly smaller than the balls which advance with the choux formed, cut the dough. 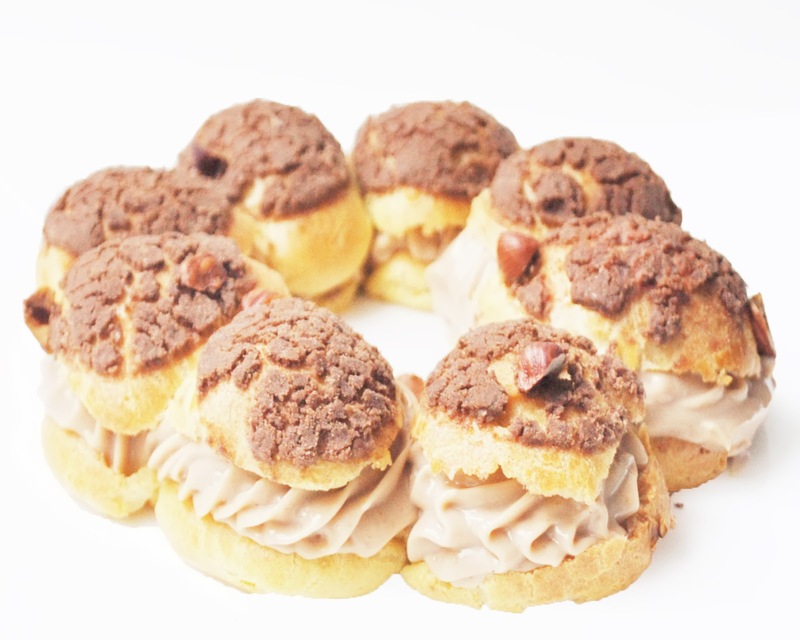 Place each circle over a ball of choux. Bring to preheated oven at 180 ° for about 25 minutes. Once completely cooled, fill with the cream.